Super Typhoon Haiyan's death count, which was estimated at 10,000 a few days ago, may not be as high as once thought before all is said and done. Estimates are starting to trend towards 2,500 according to Philippine officials. Regardless, the high loss of life is still one that reflects not only the storm's strength, its trek over a densely populated area, but also to a litany of other factors. First, any time you have 150 mile per hour winds going over any real estate, you're going to see some serious levels of damage...no matter where it takes place. Putting that over a populated area just compounds that problem. Tacloban sits at a point and the end of a bay, essentially acting as a funnel in times of a typhoon to push a wall of water inland from the sea. Surge levels reached seventeen feet at Tacloban's Airport, with waves of fifteen feet on top of that adding insult to injury. Tacloban, despite its relatively low poverty rates compared to the rest of the Philippines, is still a very densely populated city in an area that doesn't have a strong infrastructure on the order of other places globally. The city of 220,000 people had little recourse in terms of evacuations, with people forced to hunker down in sturdier shelter or fend for themselves as the city is on an island with only one bridge out. Add to that the construction quality (or lack thereof) in many parts of the Philippines and you have the recipe for disaster. Hurricane Andrew was the last Category 5 storm to hit the United States - hitting just south of Miami in 1992. While that storm was smaller in geographic size than Haiyan, it wiped out large parcels of property in South Florida and killed 44 through the state of Florida. That said, the level of damage and destruction paled in large part due to sturdier construction standards and partly due to luck. Had the storm track shifted 20-30 miles north, much of Miami would have been in the path of the eyewall and it's likely the death toll and property damage tally would have been a good bit higher. The final death toll in the Philippines will certainly not approach the highest of global history. 2008's Cyclone Nargis killed 140,000 in Myanmar, 84,000 in one municipality alone from storm surge flooding due to the tropical cyclone coming ashore near the Irrawaddy River delta. 1991's Bangladesh cyclone killed over 135,000 as it moved inland over an impoverished and low lying landmass. 1970's Bhola Cyclone killed at least 300,000, hitting near the India-Bangladesh coastline, part of the same impoverished part of the world. In the Bhola cyclone, the handling of the disaster by the ruling Pakistani government (Pakistan controlled Bangladesh from the 1947 Partition of India) lead to increased tensions between the two portions of Pakistan and indirectly helped forced the Civil War that pushed Bangladesh to independence. In all these areas, storms moved over incredibly dense populated areas, areas that are largely impoverished and without solid infrastructure. These comparisons aren't in any way shown to minimize the impact of a really bad situation in the Philippines. If anything, it shows that areas can fare incredibly worse and have through history. My hope is that relief can quickly get to Tacloban and other areas most seriously impacted by this storm, which will go a ways to limit the potential for loss of life and further illness due to disease that could break out in these areas in the aftermath of the storm. In Nargis, Bhola, and the '91 storm relief efforts were slow to terrible by the respective governments in these countries, with Nargis in particular being a tire fire for recovery efforts that lead to the Bush administration blasting the ruling Myanmar military. Hopefully history does not repeat itself in a different part of the world and aid gets in quickly and the Philippines does not put up roadblocks to recovery. 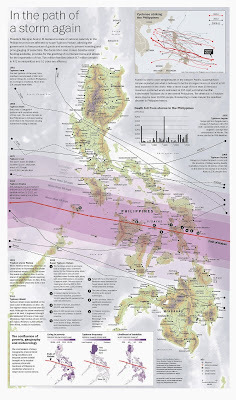 The Philippines do have a notorious history with typhoons, laying in the main "typhoon belt" in the Western Pacific. Typically, Luzon (the northern big island) gets the lion's share of tracks but in the case of Bopha last year and Washi in 2011, the southern islands do get hit on occasion with storms and they do cause tremendous impact. Bopha killed about 2000 individuals. The graphic on the left, which I found on Tumblr's NewsIllustrated feed, shows the past history of bad storms in the Philippines. On another note, it does behoove nations to take a proactive approach to dealing with storm surge and large scale tropical cyclones. Jason Samenow at Capital Weather Gang has a solid read that provides some action steps that nations can take. Education, obviously, the biggest of these. As forecasts become more accurate, in general, with tropical cyclone track and intensity, it should lead in theory to diminishing loss of life tallies in most cases going forward. In the end, though, it falls on governments to ensure a warning system is in place to provide as much warning and hopefully as much shelter as possible. It doesn't guarantee everyone survives, but the hope is that as many lives are saved as possible.